University looms. Our twin sons are counting the days until they can flee the nest. One has chosen Glasgow, while his brother is heading for Edinburgh: they are going their separate ways. I’m not surprised. 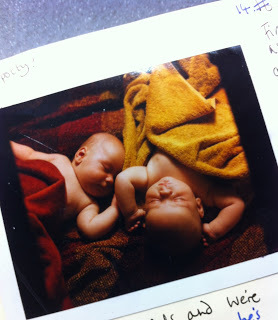 While Jimmy and I have rarely thought of them as ‘the twins’, they have put up with being a pair for 18 years. Our boys have always sat side by side at the dinner table and in the car. They’ve been taken out to buy school uniforms together and been in many of the same classes at school. Occasionally, friends have sent them shared birthday cards – a massive faux pas in their book – and, of course, larger presents (eg, the wooden fort) were bought for them to play with together. Until secondary school they shared a bedroom and on holidays they’d be squished up together in a tiny tent. Who wouldn’t be a little sick of seeing that other person’s face? As an only child myself, I can’t quite imagine how it feels to have a sibling – let alone a twin. But I’m sure it’s pretty annoying to have a relative refer to you as ‘that one’ or ‘the other one’, or to attract your attention by calling out, ‘Boys!’ when only one of you is present. I can understand their fierce desire for independence – not just from us, tedious Mum and Dad who nag about untidy bedrooms and staying out too late – but from each other too. To be able to reinvent yourself as an individual is a wonderful thing. I vividly remember the day I left home, in 1982, when my parents dropped me off at a bedsit in Dundee where I was starting a new job. The fact that I would be living on the east coast of Scotland – while my parents were on the west – felt about right. Suddenly finding myself alone felt thrilling and slightly scary. It also occurred to me, as Mum and Dad drove away, that now – within reason – I could do, and be, anything I wanted. Before our boys picked their courses, certain friends suggested that we should encourage them to choose the same uni and buy a flat for them to share. Never mind that we don’t have the cash for investing in property. Imagine being forced to be flatmates with your twin! They have bickered over who finished the last of the milkshake for long enough. They deserve a break from all that – and from each other. Although Jimmy and I have tried to make each of our sons feel like their own person, there’s a limit to how much a time-pressed parent can do. Friends with triplets used to make a point of taking each daughter out individually for some one-to-one time. I was in awe at how they managed it. Jimmy and I tried this too – but, realistically, it was so much easier to go out en mass. Perhaps a better mother than me would have read each child their own bedtime story – but, realistically, who has the time or the energy for that? They were lucky if I managed to get through The Elves and the Shoemaker without conking out and dribbling on their pillow. While I’m sad at the thought of our boys leaving us, I can understand their keenness to be viewed as individuals and not just one of a pair. So I’ll put on a big, brave smile as we set out to buy two duvets/pillows/starter packs of crockery. I’ll comfort myself with the thought that, while we haven’t been perfect parents, we’ve just done our best. And now they no longer need us. It’s fine, of course it is. What am I, one of those mothers who hates the idea of her kids growing up? No… I just seem to have something in my eye.